Looking for BBC female to male banana, (example pico amp clamp to snapon verus. Most snap on users use this BNC F to stacking banana plug adapter. This adapter can also be order in a custom length if you need it longer. 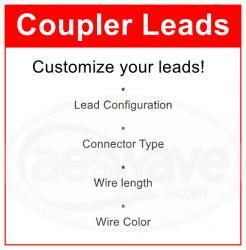 The best way order a custom test lead is to call in and place the order. You can use the reference part number 08-86-F-10ft (this would be a 10ft version of the above adapter) and then tell us how long you want the lead.